Microsoft Azure's Application Insights is a popular application performance monitoring tool. This course will show you how to embed application insights into your project and how to analyze that collected telemetry from the Azure portal. Part of building a successful web application is understanding how your application is being used and capturing exceptions before your users have a chance to report them. This requires embedding application monitoring within the logic of your application. 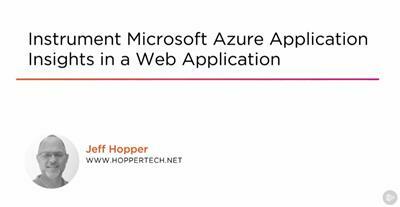 In this course, Instrument Microsoft Azure Application Insights in a Web Application, you will receive an overview of how Application Insights can help you achieve this. First, you will learn how to integrate the SDK into your project. Next, you will explore the different metrics available for tracking. Finally, you will discover several different means to review and analyze these metrics within the Azure portal. When you are finished with this course, you'll have a foundational knowledge of the types of metrics available to help you monitor your application.